The Nippon Foundation-GEBCO Seabed 2030 project was officially launched by Mr Yohei Sasakawa, chairman of The Nippon Foundation, at the United Nations Oceans Conference in 2017. The project supports the UN’s Sustainable Development Goal 14 - ‘To conserve and sustainably use the oceans, seas and marine resources for sustainable development’ - and will lead to a greater understanding of the ocean and its processes. The goal of the Seabed 2030 project is simple: to map the entirety of the world’s ocean floor by the year 2030. This ambition has undoubtedly caught the attention of the public and is a mantra that will drive the project. But in order to be a useful benchmark against which success can be measured, ‘mapping the seafloor’ must be well defined. Ideally, the seafloor should be mapped to the same level of detail as the best maps on land. The limitations of optical imaging through water, however, require the use of acoustic techniques. The project’s target mapping resolutions are based on acoustic mapping from surface vessels, and that is inherently depth dependent. Bathymetry resolution is not ‘one size fits all’. 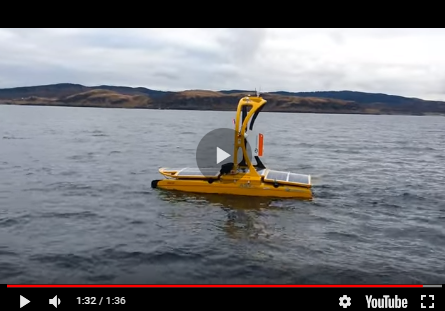 For the purpose of computing resolution goals for Seabed 2030, the project’s establishment team of leading ocean mapping experts considered what is achievable with multibeam echosounders (MBES) with beam geometries of 2° × 2°. Given that high-quality MBES data can be retrieved to a maximum swath width of about four times the water depth, these target resolutions are determined by the footprint of data acquired from the outermost beams – at approximately 60° either side of the point directly beneath the MBES. Based on these assumptions, the table below shows the feasible resolution of state-of-the-art 2° × 2° deep-water multibeam sonar installed on surface vessels. The Nippon Foundation-GEBCO Seabed 2030 project will consider an area of the seafloor ‘mapped’ if at least one sounding falls in a grid cell for a given depth as shown in the table. The fact remains that less than 20% of the world’s ocean floor has been mapped using modern methods, and to map the entire ocean floor at these resolutions by 2030 is a significant undertaking. Its success relies on collaboration between the scientific community, international organisations, national hydrographic organisations and the private sector. The Nippon Foundation-GEBCO Seabed 2030 project is already teaming up with some of the world’s leading private-sector offshore survey companies such as Fugro to acquire MBES data gathered in transit. It is also currently exploring the viability of acquiring or crowdsourcing data from more than one million fishing boats and tens of thousands of cargo, passenger and cruise ships and private yachts – effectively creating a new fleet of research vessels. In February 2018, Mr Yohei Sasakawa called on the international community to rally together to support the project’s goal. To date, almost 3,000 individuals and 40 organisations have responded to that call, providing The Nippon Foundation-GEBCO Seabed 2030 project with invaluable knowledge and networks that now span more than 50 countries. And this is just the beginning.